FREE WiFi now available in the apartment. A lovely apartment, situated in a prime location in the village of Oz-en-Oisans. The apartment is on the 3rd and 4th floor of Les Myrtilles Apartments, which are located right in the centre of this pretty village. It is possible to ski in/out of the apartments with the ski locker room being just a few yards from the Ski school & meeting point. Oz-en-Oisans is a picturesque and family friendly village, perched in the mountains at 1350m between Alps d’Huez and Vaujany. Although it was one of the last ski resorts to be built in the Alps (1989) it has a traditional village atmosphere. The centre of the village around the apartments is pedestrianized, but with car parking close by, so you just have to look out for runaway skiers and boarders! There is lots to do within the village, whether its summer or winter, and of course the mountains are there for skiing, walking, cycling and all the usual activities. All the main amenities are within a few meters of the apartment: Supermarket, boulangerie, ski hire shops, and swimming pool and of course the ski lifts are really easy to access. 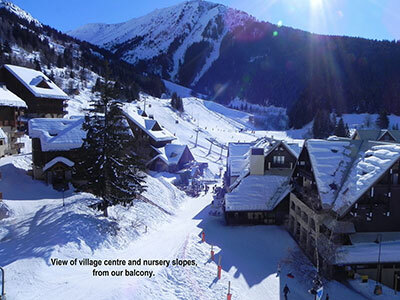 You can ski through the village to Le Poutran gondola, which is about 100m from the apartment. 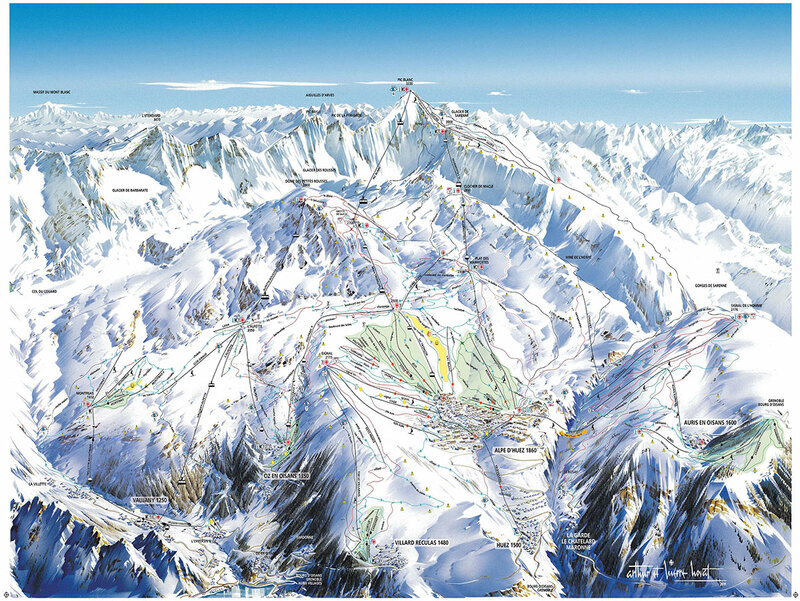 This gives access to the vast skiing area of Alps d’Huez, while L’Alpette gondola is about 50m above the apartment and gives direct access to the Vaujany region and on up to the summit of Pic Blanc (at 3,330 m) from where you can ski down the Sarenne run, apparently the longest black ski run in the Alps, 16 km of pure enjoyment with a stunning backdrop. Just next to Le Poutran gondola are the nursery slopes with a “moving carpet” taking beginners up the slope in a safe and easy manner. Above this a short button draglift can take you up the next level. From here there are three runs down to the village allowing gentle progress for the beginner. Also around the nursery slope is a toboggan area. Other activities in the village are ice-skating, a climbing wall, and swimming pool. Skiing from Oz offers a great range for all abilities. There are the wide green and blue slopes of Alps d’Huez from the top of the Poutran and also from here the snowboard park for the more adventurous. In the last couple of year the resort has added Marcel's Farm for children with tunnels, a small half pipe and what else but a cow slalom! The area above Vaujany tends to be quieter, again with a mix of green, blue, red and black. 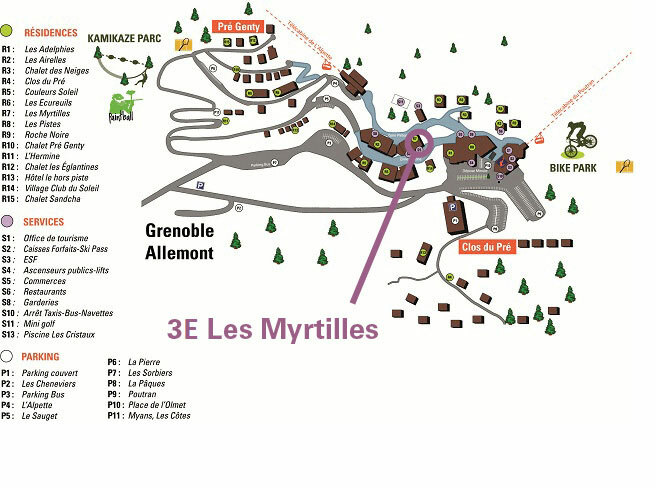 Another snowboard park can be found in Montfrais. If you want the option of returning to the apartment for lunch, it couldn’t be easier in Oz-en-Oisans, to ski back for a relaxed lunch in the comfort of your apartment, but there are also lots of choices to stay up in the mountain restaurants. The supermarket offers a good choice of fresh foods and other groceries, They also have a small range of fresh speciality cooking, including fondue and roast chickens. Oz has a good deli, with a wide selection of charcuteries and local cheeses, and a boulangerie (bakery.) There are several restaurants, offering a range from traditional alpine food to the ubiquitous pizza and pasta. Oz does not have any night clubs, so if that's what you want I suggest you look elsewhere but of course, this does mean that night time in the village is quiet and ideal for families!! The spacious apartment has three balconies, the main one facing south, and over looking the ski slopes while the other two, being smaller, face the early morning sun. The open plan lower floor has a large sitting room area with kitchen and dining area set off. There is a 32” flat screen TV and a Blue-Ray player, together with a large range of films on disc. The new kitchen is well equipped, having a dishwasher, oven, microwave and coffee making facilities. There is a breakfast bar, for 4 people. There is also a washing machine in the kitchen. There are three bedrooms. A double bedroom on the lower floor with adjacent bathroom, with a 'jacuzzi' bath. Upstairs are two bedrooms, one of good proportion with zip and link beds, offering a choice of a large double or twins. The other bedroom has limited head height, and is particularly suited to children, but will take adults. Between the two bedrooms is the showeroom with a luxurious and spacious rain shower. Both bathrooms were recently completely refurbished.